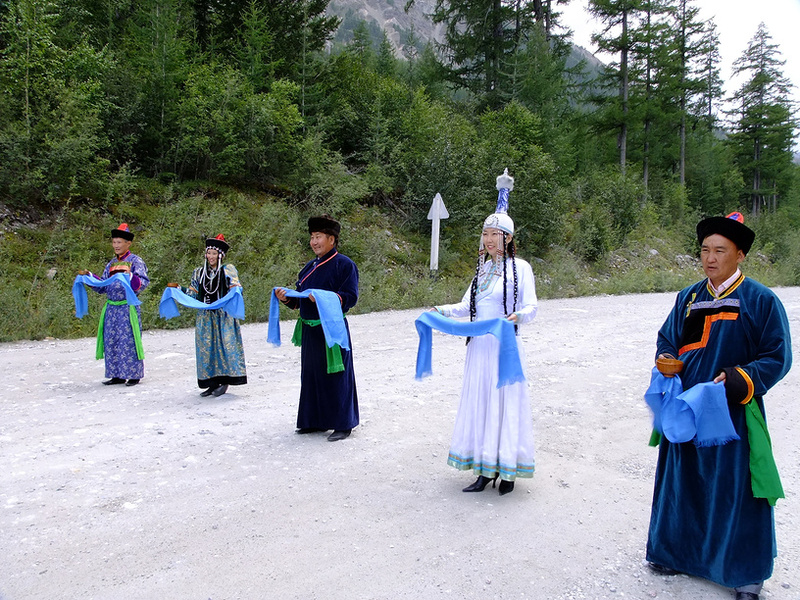 In the west of Buryatia (a region of Russia), in the Oka area lives a small but very ancient ethnicity – Soyot. Several thousand years ago, the ancestors of Soyot, numerous protosamod tribes occupied the territory of the Eastern Sayan. In around 1st century BC Soyots were significantly pushed out by the migrants from Central Asia — Turkic tribes. Turkization of indigenous population took place. But this was reflected mainly in the language change of Soyots. Much greater impact on the language, lifestyle, religion and culture of this nation had Buryat tribes of northern Mongolia, who headed into this region after 18 centuries. Originally Soyots spoke the Samoyedic language. After Turkization there was formed Soyot-tsatansky language, and after the confluence with the Buryats almost all natives began speaking the Buryat language. At the beginning of the 21st century 96% of the indigenous population spoke Buryat language, and almost 90% could also speak Russian. In 2005, national Soyot schools emerged that started teaching the Soyot language. Although “buryatization” brought to Soyots new religion — Lamaism, still shamanism and superstitions are the basis of their religious mindset. Many superstitions and taboos are associated with the established worship of mountains and earth. At the foot of sacred mountains, there were worship rites of mountain spirit. A tree was chosen, “murgel”, which was given special properties. It was believed that it affected a person’s life. Wise Soyots retained their attitude towards the world around them. They have always believed that everything has a soul, and everything in the world is interconnected. That is where their respectful and mindful attitude for nature and the awareness of the universe’s invisible connections come from. Soyots domesticated northern reindeer. And to this day reindeer breeding remains their main activity. Soyots migrated 4 or more times during the year. Deer were used as transport, and also gave clothes and food. Very fat reindeer milk was consumed as food, but the meat of animals was used only in extreme cases. In ancient times Soyots believed that fishing was a sin. Soyots were taught fishing in the 19th century by the Russians who came here. According to the census of 2010, in Russia there are just over 3500 representatives of the Soyot people. On a nationwide scale – it is a drop in the sea. But it’s more than it was in 2002 (2.7 thousand). There is hope, that the Soyot people will retain their identity and will continue to be one of many peoples of Russia. And the next generations will be able to see the traditional celebrations of Soyots, try their food and marvel at their national clothes. Traditions and modernity have intricately intertwined in the lives of Soyots today: deer and solar panels, TV and shamanic rituals, leather currying and computer games. Thank you for writing this article. I happen to be one of Soyots, and glad that our history is being shared. Thank you too. Nice to meet you as one of Soyots.